With Oklahoma weather always bringing the threat of tornados and ice storms, plans should be made to endure potential power outages. With the increase of home offices, electronic equipment and increased reliance on electricity, many homeowners have purchased a portable generator for use in their home during power outages. But, they may lack a safe and economical way to connect their generator. 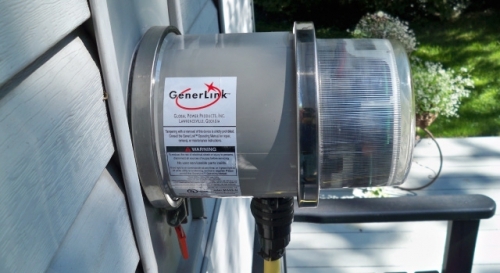 For those members using generators or wanting to purchase a generator, Lake Region Electric Cooperative now offers GenerLink™, a meter collar device installed on your electric meter that allows you to easily connect a small generator to your home during power outages. With GenerLink™ you simply plug in the generator and use your household main circuit panel to select the circuits and appliances you want to operate based on the generator capacity. Safe: GenerLink™ provides a safe means for connecting a portable generator to your home, and it automatically disconnects your home from Lake Region Electric’s power grid when the generator is connected and producing power. It prevents risky do-it-yourself solutions that can be hazardous for you, your family and Lake Region Electric personnel working to restore power. Simple: GenerLink™ is simple to use and easily installed. An Lake Region Electric employee can connect it in less than 30 minutes. You don’t even have to be home for the installation. Once connected, you just plug your generator into GenerLink™. Flexible: GenerLink™ offers you total flexibility and total control. You simply select the circuit or appliances you want to run using your home’s circuit panel. Unlike other generator connections, you can change your appliance selections at any time using GenerLink™. Affordable: Nothing else can match the benefits or price of GenerLink™ $50.00 installation fee and $25 a month with contract, or $939.69 installed with no contract. GenerLink™ is more competitively priced than any other alternative available today. For more information on GenerLink™, click here (requires Adobe PDF viewer), contact your local Lake Region Electric Cooperative office or click here to contact us. To visit GenerLink's website, click here.